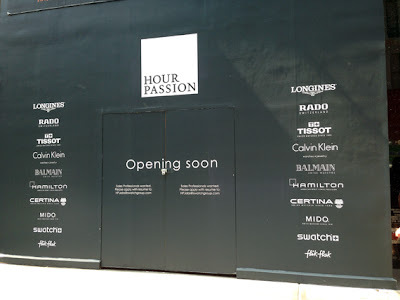 The store at 40 West 34th Street has been closed for renovations, but will re-open any day now. Possibly, it is opening now as I type. The store has a gorgeous new shiny look with big video screen included (on the second floor, below, facing the street). Also, the pop-up at Seventh and 34th Street down the block is still open for business, filling the 34th Street AEO gap during renovations. Updated to add: store has re-opened! This Swatch boutique will be opening soon at the old Billabong space in 112 West 34th Street. Look for a wide variety of brands including not just Swatch but also luxury brands like Longines and Balmain. Things are moving along fast at the old Brookstone space which will become home to a dedicated Kids Foot Locker store (below, to the right of Skechers). I get all my girl's kicks at Foot Locker just down the block, so I'm highly anticipating a whole storefront dedicated to the kids (no news on projected opening date). In what once housed Tad's Steaks will this winter become home to a big Crocs experience. I admit it, as a mom, I'm ecstatic. It doesn't matter if you scorned Crocs as a singleton, once you have kids you bow to the ease of the shoe made of a proprietary material that doesn't smell, is easy to clean, and can go from sidewalk to sprinklers, to pool, or beach and back.